The Candor Community Services Corporation would like to thank the Tioga County Senior Citizens Foundation for their recent grant of two hundred dollars. 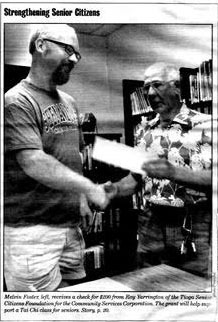 Roy Yarrington presented the check to Melvin Foster at the September meeting of CCSC, at the Candor Library. The grant will be used to help support the Tai Chi for Arthritis and Fall Prevention program, which is especially designed for senior citizens. The program is taught by Sue Heavenrich of Candor.